The description ‘slow and boring’ most certainly does not apply to this free-for-all spy adventure, and to say that it is chaotic and all over the place wouldn’t be an exaggeration. 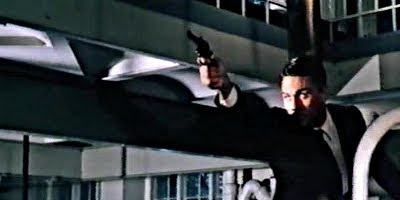 No ideas could’ve possibly been discarded during the development of the screenplay, as the filmmakers seem to check off every spy film cliché, while at the same time including numerous off the wall yet crowd pleasing ideas, such as integrating pro-wrestling moves into a cool little hand-to-hand fight scene that is wrapped up with a piledriver finishing move. Whether he’s playing Super Seven, Argoman, or in this film Agent Glenn Foster, Roger Browne seems to always feel like he’s playing the same character, which fans probably wouldn’t want any other way. Helga Liné also makes a welcome but all too brief appearance, and the catchy ‘la-la’ score manages to be fun without seeming too tongue-in-cheek.